The league released its schedule of nationally-televised games today! I’ve chosen to include only the listings for NBC, Versus and NHL Network since both of us are American (we’ll also use just Eastern times for game starts since we both live in the Eastern zone), but the Canadian listings for CBC, TSN and TSN2 are available here as well. Set your DVRs and mark your calendars. Note that some of these games are marked “NHL-Versus Flex.” That means, and I quote directly, “VERSUS game selection for that date will depend upon the game that NBC chooses for their window. Individual team exposures depend on NBC/VERSUS flex game selections and include non exclusive games.” So I guess it’s like that Hockey Day in America when everyone got the same game nationally and then there were a few that were beamed to certain markets. 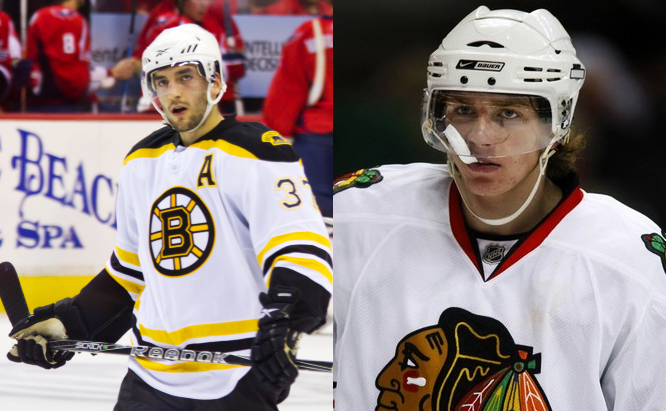 OK. I’ve also bolded games involving the Blackhawks or Bruins. The Premiere schedule is out too. October 7 is Rangers-Kings in Stockholm, Sabres-Ducks in Helsinki. October 8 is Ducks-Rangers in Stockholm, Sabres-Kings in Berlin (only on TSN2). Note that every game from here on in is flex. The Versus and NHLN schedules are too extensive for me to reformat here, so they are here and here. For NBC–I think I’ll spend Black Friday sleeping in and watching the Bruins instead of going out and doing battle against the merciless hordes of Atlanta deal-hunters. As previously rumored but never totally proven–the league had something different it needed to do first (hmph! )–the Winter Classic is indeed Rangers vs. Flyers. It’s nice to see the Sabres, Sharks, Blues, Wild and Kings appear on the NBC schedule, even if just once. Otherwise it’s very much dominated by the Flyers, Penguins, Bruins, Blackhawks, Capitals, Rangers and Red Wings. No game featuring a Canadian team will air on NBC. People aching to see how the Flyers and Penguins will get on with one another can see it on March 18 and April 1. For Versus/NBC Sports Network (as of January 2, and it’s about time)–Everyone can enjoy seeing the Bruins raise their sixth Cup banner when they host the Flyers on October 6. Versus tends to show just one game a night (instead of an Eastern one and a Western one later that night) and takes a long Thanksgiving break, showing a Kings-Blues game on the 22nd of November and then nothing new until a Lightning-Wild matchup on the 28th. If you don’t want to watch the Winter Classic, a Sharks-Canucks game will be on at 8 pm on January 2. The Team That Shall Not Be Named appears on March 5 versus the Sabres. Boston and Philadelphia have the most scheduled NBC/Versus appearances, with Pittsburgh, Detroit and Chicago running closely behind. For NHL Network–NHLN by far shows the most games. (I am furiously side-eyeing at Time Warner Cable for not making NHLN standard so Krista can enjoy it; I receive it with DirecTV Choice Xtra.) They open their bouquet with a Lightning-Bruins matchup on October 8. For them, The Team That Shall Not Be Named appears the very next day against the Habs. They also tend to show just one game a day, although sometimes, mostly Saturdays, they’ll have an Eastern game early and a Western game later. Hide out from the Black Friday brigade with Rangers-Capitals at 4, especially if your hockey hunger is still not sated after the NBC matchup that day. NHLN takes a very long Christmas vacation, with a Flyers-Rangers game on the 23rd at 7 pm and then the next game is a New Year’s Day Flames-Predators 6 pm matchup. January 7’s Canucks-Bruins 1 pm matchup should be fun. May I suggest a muzzle for Alexandre Burrows? It should also be noted, separately, that there is a Bruins game (vs the Kings) on my birthday, December 13, and a Blackhawks game (vs the Red Wings) on Krista’s birthday, February 21. If either of these gentlemen do notable things on our birthdays, that'd be a lovely present indeed. Many teams are very underrepresented on all three networks’ schedules. If you’re a huge fan of any of them and you don’t live in their local media market, you’re basically gonna need NHL Center Ice or less legitimate sources to watch your faves. Now could DirecTV please tell me how much NHL Center Ice is going to cost? I’d like to just buy it already! Keep calm, fans. The season is almost here.